NGO Monitor’s detailed report examines Human Rights Watch’s activities related to the Arab-Israeli conflict, and particularly on Israel — including analysis of key HRW staff members, five case studies of HRW campaigns, and quantitative analysis comparing HRW publications in the Middle East, covering the period from 2002 to 2009.
d. Political Agendas or Universal Human Rights? Since its founding as Helsinki Watch in 1978, Human Rights Watch (HRW) has greatly expanded its scope. While continuing its core mission in promoting human rights in closed regimes such as China, HRW devotes a large portion of its resources to issues related to international law in armed conflicts, asymmetric warfare, and responses to terrorism. In this process, HRW relies on its “halo effect” and the perception of expertise, morality, and objectivity as a non-governmental organization (NGO) to become an influential political and ideological actor. Its impact is particularly pronounced in the Arab-Israeli conflict: HRW exerts major influence on the UN and on the policies of governments through condemnations of Israel for alleged violations and demands for “independent investigations.” These allegations then become amplified through the media. 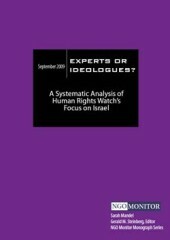 In this detailed, empirical research study, we present and analyze HRW’s activities concerning the Arab-Israeli conflict in a systematic manner, from 2001 through the middle of 2009. Our investigation shows a consistent pattern of ideological bias, lack of professional qualifications, and unsupported claims based on faulty evidence and analysis on the part of HRW. These are then replicated by governments and international organizations, including the United Nations, that adopt these allegations. 1) An examination of the key HRW staff members with respect to their professional backgrounds, research expertise, and ideological bias concerning Israel. 2) Five detailed case studies of HRW campaigns and publications between 2001 and 2009 which reflect consistent bias, false and contradictory statements, and the use of irrelevant evidence and inappropriate methodologies, including sources (“eyewitness testimony,” NGO and journalist reports, “weapons assessments”) that are neither credible nor verifiable. 3) A broader quantitative analysis of HRW publications from 2002 to 2009, showing greatly disproportionate emphasis on Israel in the Middle East and North Africa (MENA) Division, double standards in the use of terminology such as “war crimes,” “collective punishment,” etc., and in distorted uses of international legal terminology. Section 1 reviews HRW’s history, structure, and funding, followed by a detailed analysis of the professional qualifications of key staff members, as well as an examination of quotations from publications and speeches which reflect a strong ideological bias. This analysis begins with Kenneth Roth, who has been executive director since 1993. Roth was a prosecutor before joining HRW, and is responsible for greatly expanding the organization’s agenda and claimed expertise to include international humanitarian law, as well as the systematic effort to criminalize warfare. Roth also shifted Helsinki Watch’s original mission from one of pressuring closed societies to remove their limitations on freedom, to HRW’s current emphasis on criticizing the policies of open and democratic systems, specifically regarding responses to terror. In expanding HRW’s Middle East and North Africa Division, Joe Stork was hired in 1996, and Sarah Leah Whitson joined in 2004 and was appointed director. Both had been anti-Israel activists before joining HRW. Stork was a founder and editor of the radical and post-colonial MERIP (Middle East Reports), and Whitson was on the steering committee of the American Arab Anti-Discrimination Committee (ADC), an organization heavily involved in pro-Palestinian and anti-Israel activity. Under Whitson and Stork, HRW has become disproportionately focused on criticism of Israel, using allegations of human rights and international law violations. Whitson was active in supporting the “Caterpillar” boycott campaign, and Stork promoted the anti-Israel boycott movement in conferences and other venues. They also expanded the MENA staff, adding other radical activists such as Lucy Mair, who had written anti-Israel pieces for the Electronic Intifada; Nadia Barhoum, who organized pro-Palestinian activities at the University of California, Berkeley; and Darryl Li, who also spent time working with MERIP and with Gaza-based Palestinian Center for Human Rights (PCHR) – a prominent anti-Israel NGO. Other ideologically biased activists among HRW’s leadership include Reed Brody, who led the delegation to the NGO Forum of the 2001 Durban Conference, where he joined in preventing pro-Israel participants from speaking. He also played a major role in the effort to bring Israeli Prime Minister Sharon to trial on war crimes charges in Belgium. Section 2 presents five case studies in detail, demonstrating the impact of HRW reports and campaigns involving Israel, Palestinians (including Hamas during the recent Gaza War), and Hezbollah (in the 2006 Lebanon War) between 2001 and 2009. These case studies illustrate the absence of the professional methodologies and expertise required for fact-finding related to violent conflict. The nature and circumstances of the four armed conflict cases – Gaza Beach (2006), the numerous reports during and after the 2006 Lebanon War, the “Reuters Cameraman Incident” (2008), and multiple publications related to the Gaza War (December 2008-January 2009) – vary significantly. But they share a reliance on questionable sources and interested parties (“eyewitnesses” in areas dominated by Hamas and Hezbollah), an absence of an appropriate methodology, deviations from universal human rights norms, and sweeping allegations of Israeli “war crimes” or “indiscriminate attack” based on inadequate and/or insufficient evidence, all tied to HRW’s ideological agenda. Reliance on problematic eyewitnesses and local NGOs with limited credibility, acceptance of unverifiable “forensic” evidence provided by Palestinian officials, and rejection of Israeli evidence as inherently biased. Omission of evidence that does not support the ideological conclusions, including videos of Hamas and Hezbollah using civilians as human shields to protect military assets and activities. Artificial narrowing of legal terms, which frame Israeli guilt from the beginning, and erasure of the wider context of Palestinian attacks and legitimate self-defense (Razing Rafah, Gaza Beach, Lebanon and Gaza War reports). Inclusion of irrelevant technical, legal, and medical details to create the façade of expertise. Repeated campaigns for ostensibly independent investigations focused solely on allegations against Israel. Section 3 applies quantitative measures to analyze HRW’s relationship with Israel, in comparison to the resources, agendas, and emphases regarding other countries and non-state actors (Hezbollah, Hamas) in the Middle East Division. The weighted methodology illustrates their disproportionate and obsessive focus on Israeli military actions, with concomitantly less attention given to the absence of fundamental freedoms and totalitarian rule that are endemic to other countries in the region. To expand the analysis, NGO Monitor studies have also examined the use of language in relation to various Middle Eastern states. Here too, Israel is consistently singled out for condemnation, using particularly harsh language, while Palestinian and Arab human rights violations are minimized. Recommendations: On the basis of this analysis, and the clear findings of bias, double standards, and inappropriate methodology in HRW’s activities related to Israel, we suggest a number of critical changes to be implemented by the board of directors. a) Formation of a governing board independent of the executive director, with direct involvement in top employment and related personnel decisions. b) Review of HRW’s mission and priorities, to decide which activities and areas of concentration are compatible with HRW’s professional capabilities and resources. HRW must also determine whether its mission ought to be devoted to the grave human rights abuses that are endemic to closed, undemocratic societies, or whether it should continue to devote scarce donor resources toward investigating democracies. c) Professional guidelines are needed at every operational level and division to ensure that decisions are made strictly on a professional, rather than ideological, basis. Accuracy before advocacy. d) An independent ombudsman should be employed to monitor the implementation of these guidelines, including the removal of ideological and other bias. This position should be filled without the input of the executive director, and funded with five percent of HRW’s overall budget. The ombudsman should have the authority to prevent publication of any document or the implementation of any program. e) Transparency in HRW’s process of agenda setting is essential to restoring the universality and moral credibility of human rights.